As I’m writing this post, I’m also watching a train travel through Southern Norway. I often watch this train on its journey as I write. that announces the train has passed through the Store Geithammer tunnel, or I might hear the announcement for the arrival at Hokksund Station before my writing is done. Either way, I’ll write—a process that includes composing words on the screen, checking social media, playing with my puppy, doing laundry, getting food, and, yes, watching the train—until I finish, and then I’ll revise, send the post to be reviewed, revise, edit, send the post to be reviewed, edit, and publish. I’m an experienced writer, but I always expect my writing process will be slow; after all, the first trains were invented only two hundred years ago, while the technology I’m using, the written word, was invented over 5,000 years ago. My old technology, however, has the potential to carry writers and their readers further than any bus line, railroad line, or airline, if we give writers the time they need to complete their journeys. Teach writing as a complex technology that requires consistent updates. Writing should be tested and improved by the text developer, a team or peers, and the project supervisor. At the Cal U Writing Center, we’re happy to provide the peer readers that your students need, as they test their words with different audiences. Teach textual design as a process that requires slow and fast writing. While writing is a time-consuming process that requires many stops and starts, it’s also a journey that occurs in the context of a community. Outlines, drafts, revisions, and edits should arrive at their destination in a timely manner. Teach each revision as a new product. Updating and revising the draft of a text is transformative work, for the author and for the text. The revised draft should be assessed as a new creation in light of those transformations. Teach writers to create the text from the ideas completely, then, after the work is completed, to find and remove the design flaws. Invention is a difficult enough process in its own right. Writers distracted by a preemptive focus on creating a flawless product may inhibit discoveries that propel their best ideas forward. Teach students to experiment. There is no separate writing process known as creative writing. Creativity is an element of even the most transactional genres of writing, and, more than teaching students to produce a written text, we teach students to use the technology of words to develop their abilities to experiment, to discover, and to create. I watch my train pass through the mountains, and always as I write, I remember another train that travelled through my literacy experience. 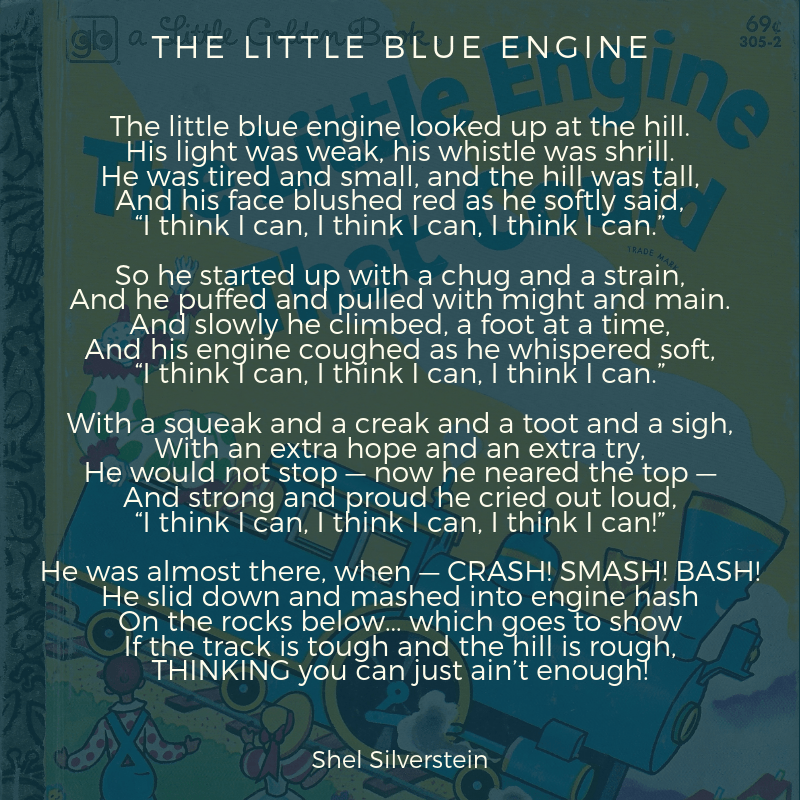 That train was born in a Little Golden Book from my childhood, and it taught me that I’m capable of more than I imagine. That’s true, I know, as I look around and see that a mantra of “I think I can” has brought me this far. At this same time, I’ve read the books our students read in their childhoods, and I realize that belief carries us only so far. Action must carry us over the mountains.